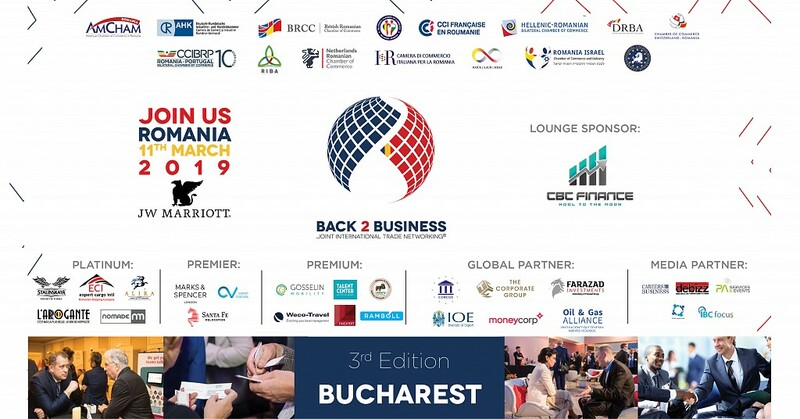 Join us on March 11, 2019 at JW Marriott Grand Hotel and be part of the well-known International event, BACK 2 BUSINESS that happens every year in Bucharest. The event will gather 15 Chambers of Commerce and up to 500 professionals for a night of business networking. By registering to BACK 2 BUSINESS you will have access to our dedicated online platform through which you would be able to connect with participants prior to the event. In addition, we have the BACK 2 BUSINESS networking lounge to allow for a personal 1 on 1 meetings during the event. This year, BACK 2 BUSINESS is delighted to bring Roger Harrop, The CEO Expert, Author and International Speaker as Guest speaker. We strongly encourage you to attend his workshop as you will have a memorable experience that boosts morale and teamwork in your organization. BACK 2 BUSINESS attracts a very high-profile business audience, merging both the public and private sectors in one unique networking event.